Check out amazing footage from the video cameras mounted on the twin solid rocket boosters during space shuttle Discovery's nighttime launch. Relive space shuttle Discovery's STS-116 mission to the International Space Station. We have nearly 200 movie clips from the December flight that installed a new truss segment and retracted a stubborn solar wing. It was a beautiful sunrise blastoff for the Orbital Sciences Minotaur rocket from Wallops Flight Facility carrying the Air Force's TacSat 2 spacecraft and NASA's GeneSat 1. The first United Launch Alliance Delta 2 rocket blasts off from California's Vandenberg Air Force Base carrying a classified payload for the National Reconnaissance Office. Mars Global Surveyor has found bright new deposits in two gullies that suggest water may have spurted on the surface during the past few years. The images are presented by scientists in this news briefing presentation. Astronomers have found a black hole where few thought they could ever exist, inside a globular star cluster. The finding has broad implications for the dynamics of stars clusters and also for the existence of a still-speculative new class of black holes called 'intermediate-mass' black holes. � The discovery is reported in the current issue of Nature. Tom Maccarone of the University of Southampton in England leads an international team on the finding, made primarily with the European Space Agency's XMM-Newton satellite. Globular clusters are dense bundles of thousands to millions of old stars, and many scientists have doubted that black holes could survive in such an exclusive environment. Computer simulations show that a newly formed black hole would first sink towards the centre of the cluster but quickly get gravitationally slingshot out entirely when interacting with the cluster's myriad stars. The new finding provides the first convincing evidence that some black hole might not only survive but grow and flourish in globular clusters. What has astonished astronomers is how quickly the black hole was found. "We were preparing for a long, systematic search of thousands of globular clusters with the hope of finding just one black hole," said Maccarone. "But bingo, we found one as soon as we started the search. It was only the second globular cluster we looked at." The search continues to find more, Maccarone said, yet only one black hole was needed to resolve the decades-old discussion about black holes and globular clusters. Scientists say there are two main classes of black holes. Supermassive black holes containing the mass of millions to billions of suns are found in the core of most galaxies, including our own. A quasar is one kind of supermassive black hole. Stellar-size black holes contain the mass of about ten suns. These are created from the collapsed core of massive stars. Our galaxy likely contains millions of these black holes. XMM-Newton is extremely sensitive to variable X-ray sources and can efficiently search across large patches of the sky. The team also used NASA's Chandra X-ray Observatory, which has superb angular resolution to pinpoint the X-ray source's location. This allowed them to match up the position of the X-ray source with optical images to prove that the black hole was indeed in a globular cluster. Globular clusters are some of the oldest structures in the universe, containing stars over 12 thousand million years old. Black holes in a cluster would likely have formed many thousand millions of years ago, which is why astronomers have assumed they would have been kicked out a long time ago. Details in the X-ray light detected by XMM-Newton leave little doubt that this is a black hole - the object is too bright, and varies by too much to be anything else. In fact, the source is 'extra bright', - an Ultraluminous X-ray object, or ULX. ULXs are brighter than the 'Eddington limit' for stellar mass black holes, the brightness level at which the outward force from X-rays is expected balance the powerful gravitational forces from the black hole. 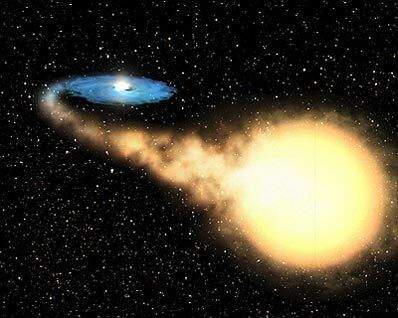 Thus it is often suggested that the ULXs might be intermediate mass black holes - black holes of thousands of solar masses, heavier than the 10-solar-mass stellar black holes, and lighter than the million to thousand million solar mass black holes in quasars. These black holes might then be the missing links between the black holes formed in the death throes of massive stars and the ones in the centres of galaxies. It is perhaps possible for a stellar-mass black hole to gain enough mass through merging with other stellar-mass black holes or accreting star gas to stay locked in a cluster. About 100 solar masses would do. Once entrenched, the black hole has the opportunity to merge with other black holes or accrete gas from a local neighbourhood rife with star-stuff. In this way, they could grow into IMBHs. "If a black hole is massive enough, there's a good chance it can survive the pressures of living in a globular cluster, since it will be too heavy to be kicked out," said Arunav Kundu of Michigan State University, a co-author on the Nature report. "That's what is intriguing about this discovery. We may be seeing how a black hole can grow considerably, become more entrenched in the cluster, and then grow some more. "On the other hand," continued Kundu, "there are a variety of ways to make ULXs without requiring intermediate mass black holes. In particular, if the light goes out in a different direction than the one from which the gas comes in, it doesn't put any force on the gas. Also, if the light can be 'focused' towards us by reflecting off the gas in the same way that light from a flashlight bulb bounces off the little mirror in the flashlight, making the object appear brighter than it really is." Ongoing work will help to determine whether this object is a stellar-mass black hole showing an unusual manner of sucking in gas, allowing it to be extra bright, or an IMBH. The team, which also includes Steve Zepf from Michigan State University, and Katherine Rhode from Wesleyan University, has data for thousands of other globular clusters, which they are now analyzing in an effort to determine just how common this phenomenon is.